Cosmic shear, the weak gravitational lensing caused by the large-scale structure, is one of the primary probes to test gravity with current and future surveys. 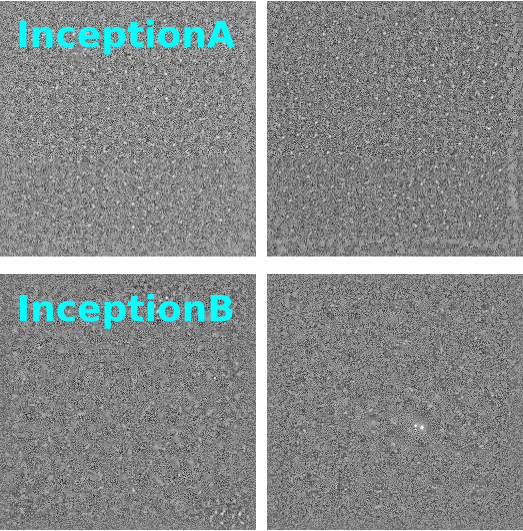 There are two main techniques to analyse a cosmic shear survey; a tomographic method, where correlations between the lensing signal in different redshift bins are used to recover redshift information, and a 3D approach, where the full redshift information is carried through the entire analysis. Here we compare the two methods, by forecasting cosmological constraints for future surveys like Euclid. We extend the 3D formalism for the first time to theories beyond the standard model, belonging to the Horndeski class. This includes the majority of universally coupled extensions to LCDM with one scalar degree of freedom in addition to the metric, which are still in agreement with current observations. Given a fixed background, the evolution of linear perturbations in Horndeski gravity is described by a set of four functions of time only. We model their time evolution assuming proportionality to the dark energy density fraction and place Fisher matrix constraints on the proportionality coefficients. 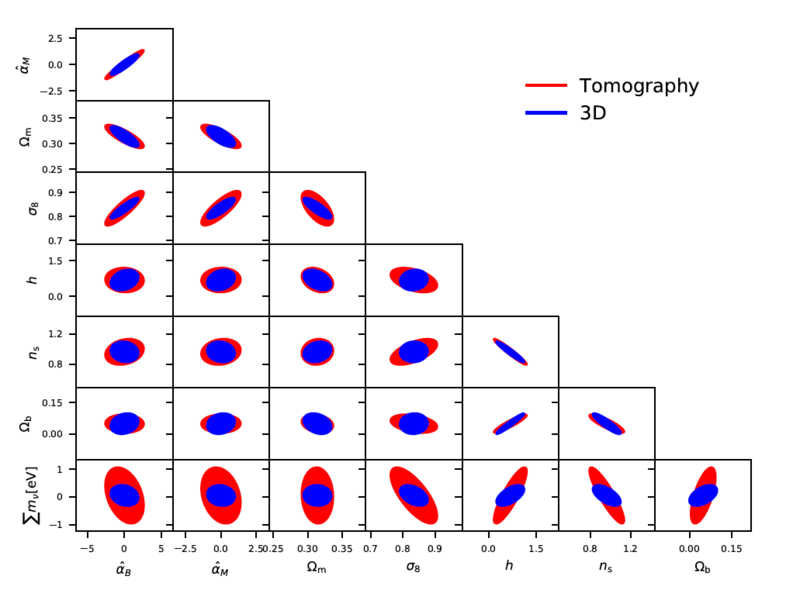 We find that a 3D analysis can constrain Horndeski theories better than a tomographic one, in particular with a decrease in the errors on the Horndeski parameters of the order of 20 - 30%. This paper shows for the first time a quantitative comparison on an equal footing between Fisher matrix forecasts for both a fully 3D and a tomographic analysis of cosmic shear surveys. The increased sensitivity of the 3D formalism comes from its ability to retain information on the source redshifts along the entire analysis. A new paper has been put on the arXiv, led by Alessio Spurio Mancini, PhD student of CosmoStat member Valeria Pettorino in collaboration with R. Reischke, B.M. 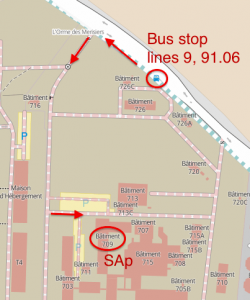 Scháefer (Heidelberg) and M. Zumalacárregui (Berkeley LBNL and Paris Saclay IPhT). The authors investigate the performance of a 3D analysis of cosmic shear measurements vs a tomographic analysis as a probe of Horndeski theories of modified gravity, setting constraints by means of a Fisher matrix analysis on the parameters that describe the evolution of linear perturbations, using the specifications of a future Euclid-like experiment. Constraints are shown on both the modified gravity parameters and on a set of standard cosmological parameters, including the sum of neutrino masses. The analysis is restricted to angular modes ell < 1000 and k < 1 h/Mpc to avoid the deeply non-linear regime of structure growth. Below the main results of the paper. The signal-to-noise ratio of both a 3D analysis as well as a tomographic one is very similar. 3D cosmic shear provides tighter constraints than tomography for most cosmological parameters, with both methods showing very similar degeneracies. gain is of the order of 20 - 30 % in the errors. 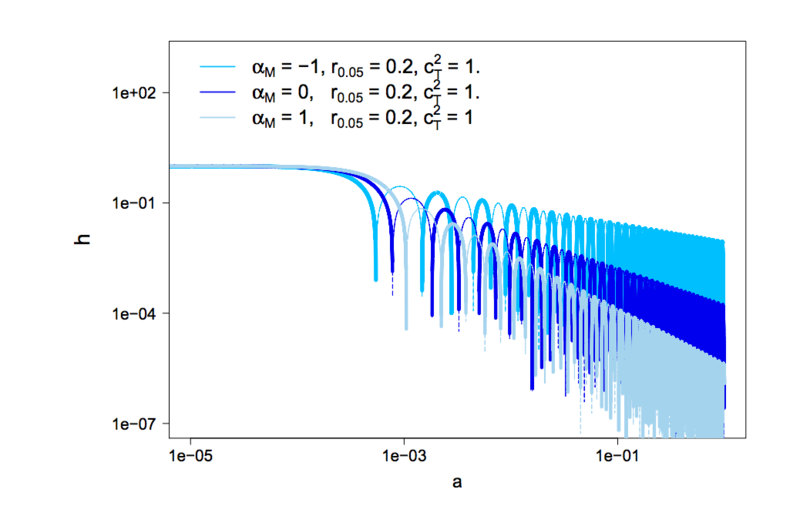 In Horndeski theories, braiding and the effective Newton coupling parameters (\alpha_B and \alpha_M) are constrained better if the kineticity is higher. We investigated the impact on non-linear scales, and introduced an artificial screening scale, which pushes the deviations from General Relativity to zero below its value. The gain when including the non-linear signal calls for the development of analytic or semi-analytic prescriptions for the treatment of non-linear scales in ΛCDM and modified gravity. Modified Gravity theories generally affect the Poisson equation and the gravitational slip (effective anisotropic stress) in an observable way, that can be parameterized by two generic functions (η and μ) of time and space. We bin the time dependence of these functions in redshift and present forecasts on each bin for future surveys like Euclid. We consider both Galaxy Clustering and Weak Lensing surveys, showing the impact of the non-linear regime, treated with two different semi-analytical approximations. In addition to these future observables, we use a prior covariance matrix derived from the Planck observations of the Cosmic Microwave Background. 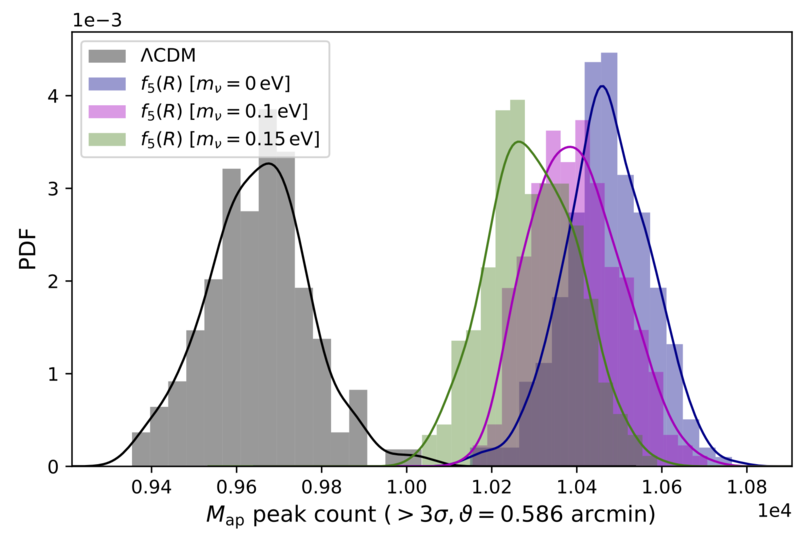 Our results show that η and μ in different redshift bins are significantly correlated, but including non-linear scales reduces or even eliminates the correlation, breaking the degeneracy between Modified Gravity parameters and the overall amplitude of the matter power spectrum. We further decorrelate parameters with a Zero-phase Component Analysis and identify which combinations of the Modified Gravity parameter amplitudes, in different redshift bins, are best constrained by future surveys. 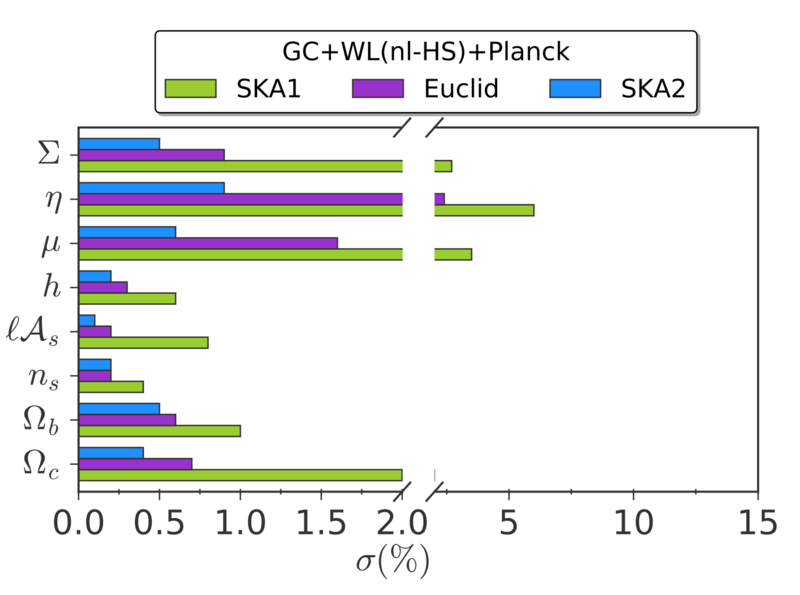 We also extend the analysis to two particular parameterizations of the time evolution of μ and η and consider, in addition to Euclid, also SKA1, SKA2, DESI: we find in this case that future surveys will be able to constrain the current values of η and μ at the 2−5% level when using only linear scales (wavevector k < 0.15 h/Mpc), depending on the specific time parameterization; sensitivity improves to about 1% when non-linearities are included. A new paper has been put on the arXiv by new CosmoStat member Valeria Pettorino, her PhD student Santiago Casas, in collaboration with Martin Kunz (Geneva) and Matteo Martinelli (Leiden). The authors discuss forecasts in Modified Gravity cosmologies, described by two generic functions of time and space [Planck Dark Energy and Modified Gravity 2015, Asaba et al 2013,Bull 2015, Alonso et al 2016]. 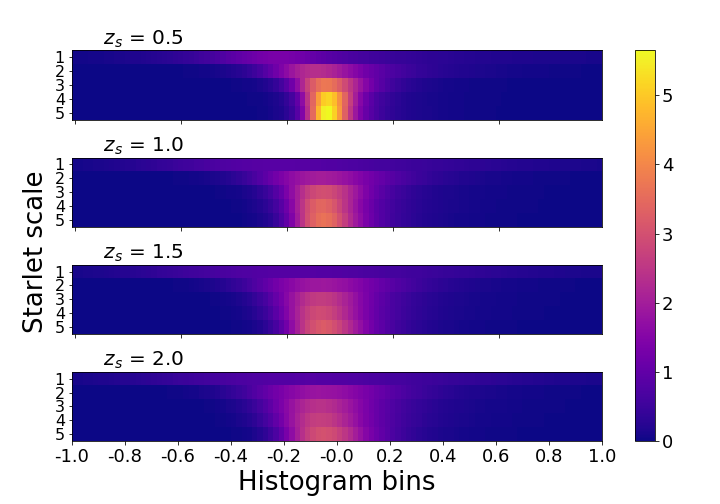 Their amplitude is constrained in different redshift bins. The authors elaborate on the impact of non-linear scales, showing that their inclusion (via a non-linear semi-analytical prescription applied to Modified Gravity) enables to highly reduce correlation among different redshift bins, even before any decorrelation procedure is applied. 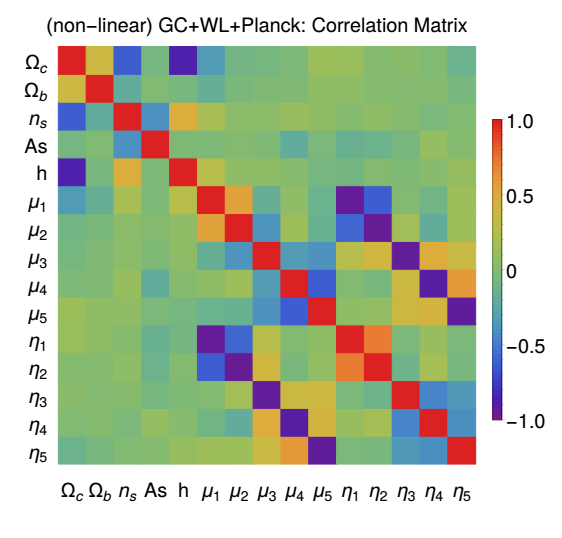 This is visually seen in the figure below (Fig.4 of arXiv), for the case of Galaxy Clustering: the correlation Matrix of the cosmological parameters (including the amplitudes of the Modified Gravity functions, binned in redshift) is much more diagonal in the non-linear case (right panel) than in the linear one (left panel). A decorrelation procedure (Zero-phase Component Analysis, ZCA) is anyway used to extract those combinations which are best constrained by future surveys such as Euclid. With respect to Principal Component Analysis, ZCA allows to find a new vector of uncorrelated variables that is as similar as possible to the original vector of variables. The authors further consider two smooth time functions whose main allowed to depart from General Relativity only at late times (late-time parameterization) or able to detach also at early times (early-time parameterization). 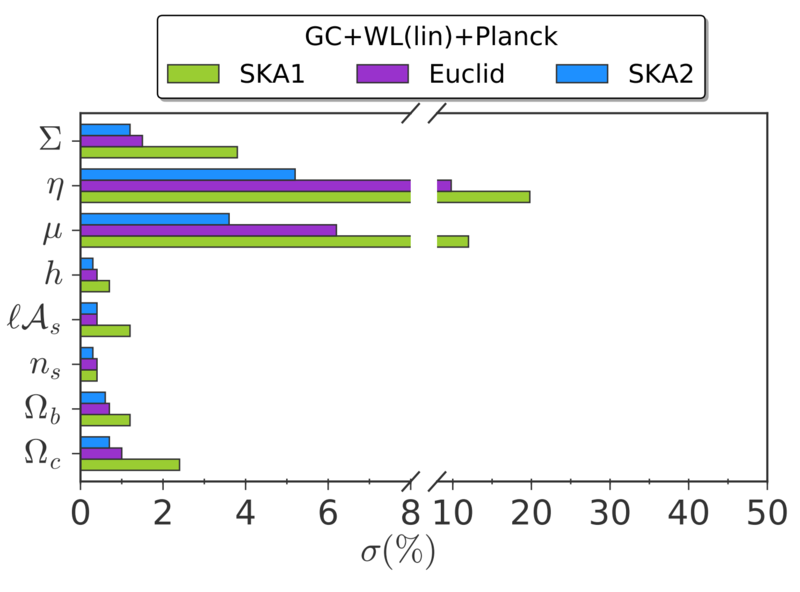 The Fisher Matrix forecasts for standard and Modified gravity parameters, for different surveys (Euclid, SKA1, SKA2) is shown in the plot below (extracted from Fig.15 of arXiv), in which Galaxy Clustering and Weak Lensing probes are combined. Left panel refers to linear analysis, right panel includes a non-linear treatment. Authors: Pettorino, V., Amendola, L.
Modified gravity theories predict in general a non standard equation for the propagation of gravitational waves. Here we discuss the impact of modified friction and speed of tensor modes on cosmic microwave polarization B modes. We show that the non standard friction term, parametrized by αM, is degenerate with the tensor-to-scalar ratio r, so that small values of r can be compensated by negative constant values of αM. We quantify this degeneracy and its dependence on the epoch at which αM is different from the standard, zero, value and on the speed of gravitational waves cT. In the particular case of scalar-tensor theories, αM is constant and strongly constrained by background and scalar perturbations, 0≤αM<0.01 and the degeneracy with r is removed. In more general cases however such tight bounds are weakened and the B modes can provide useful constraints on early-time modified gravity.